I have seen many different versions of this recipe on Pinterest and around the interwebs. A couple weeks ago, I was reminded of it as I was searching for something different to do with pork chops. There are many variations - some use milk instead of water; some use 2 cans of soup. Below is the version I settled on and they turned out to be pretty tasty. Plus, it can't get much easier. Maybe you can add it to your menu this week! Place the chops in the crock pot. In a bowl, combine the soup, dressing, and water. Pour over the chops. Cook on low for 6 hours or high for 4 hours. Voila! Let me know if you give these a try! Enjoy! I saw your photo on Facebook and my stomach growled. My husband looooves pork chops. I'm still stuck on your photo of the mashed potatoes and peas! Yum yum yum. 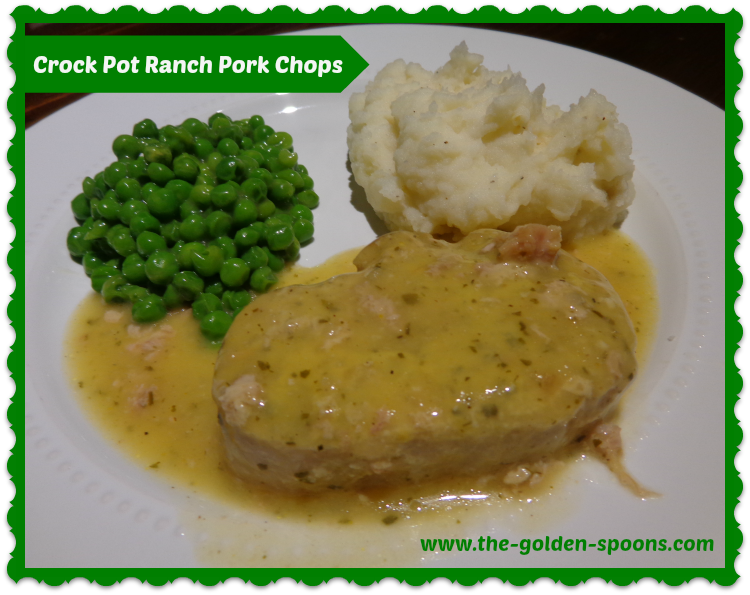 Those pork chops look tasty - I love crock pot recipes and will definitely try this one!! Now THOSE look GREAT!!! I only do easy recipes, so THIS one rocks!! I am so glad you shared this Lisa!! Those look amazing, Lisa! YUM. Plus, they look super easy (even easy enough for ME to make). YAY!! Ooo I might have to make this soon. Thank you! Sounds like Saturday dinner just got a bunch easier for me next weekend. This looks delicious. They are definitely easy. Hope you give them a try!